A marathon personal record is the ultimate challenge for most road runners. The reason: It’s long, hard and with an often unpredictable outcome. What’s more, you can’t just show up one or two weeks later and attempt it again. Therefore, a lot of careful planning has to be undertaken in order to maximize your chances for a new personal or seasonal best. This article will guide you. Speed seems to be the last concern for anyone training for a marathon. At best, speed training is somehow fit in somewhere around 4 weeks out of the actual race. Don’t be that guy! Speed, just like general endurance, is a fundamental skill and pre-condition for essential training session like VO2max intervals. Without raw speed you’ll put a cap on your marathon training and racing. VO2max, as with all distances, matters to the largest degree when it comes to achieving a faster time. The only difference being: For a 5K a higher VO2max is all it takes to crush a new PR but for a marathon it’s just one of many limiting factors. Remember, a higher VO2max indirectly elevates your lactate threshold pace as well. Thus, your marathon pace will become faster, too. Your lactate threshold dictates the pace you can sustain for 26.2 miles (42.2km). Although the marathon is run under lactate threshold pace, a higher ceiling of your LT lets you access a higher percentage of your VO2max before turning anaerobic. Fortunately, the lactate threshold is highly responsive to training and can lead to large performance gains within a few short weeks. Muscular fatigue endurance, large glycogen stores, and an efficient fat metabolism are the physiological ‘endurance’ adaptations necessary for a marathon. 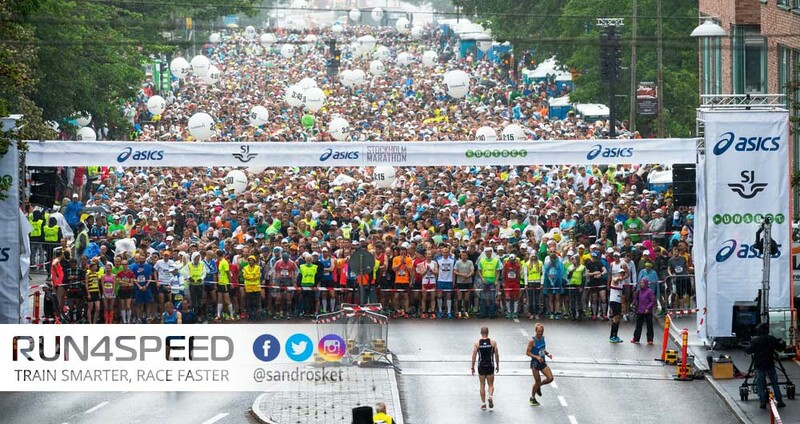 Even for advanced 10K runners or half marathoners it requires 3 to 4 months of dedicated marathon training to be sufficiently prepared for the unique demands of the marathon. Too much distance, too soon, is a recipe for burnout and injury. Easy runs and long runs should approximate 80% of your overall training mileage. (Overall training mileage should be at least 30 miles, or 45 km per week.) The long run can make up a share of 30 – 40%. Now it’s important to monitor your pace with a GPS watch (or mobile app) and ideally a heart rate monitor as well. Just because you could run faster than described doesn’t mean you should. Tempo runs are actually faster than marathon race pace. They play a key role in the ‘max-conditioning’ phase but have to give way to marathon pace workouts in the ‘race-specific’ phase. Tempo and marathon paced efforts can be done as a standalone workout or can serve as add-ons to your weekly long runs. Ideally, tempos of slightly varying paces should be run twice a week for maximum effect. Intervals may not make up a large part of marathon training but they are the key to a higher aerobic ceiling. I recommend to start with 800s at 3K pace early in your training cycle and then transition to 1000 – 1200m 5K paced intervals and eventually 1600m to 2000m 10K paced intervals. Once a week of this type of training is enough for most marathon runners. Take it easy the day before and after. Sprint repeats are not high on any marathoner’s wish list. And indeed, they should not make up a large part of training. However, used sparingly they can dramatically improve running-specific strength and running economy. A few 100m sprint repeats at 200m to 400m pace with plenty of rest is all it takes. Attach them after easy runs occasionally or after your weekly VO2max session. For your next marathon, try a different training plan. Often we have practiced certain modes of training ‘to death’ so further adaptations are hard to come by. Do an honest assessment of your weakness, whether that be endurance, speed, or perhaps speed endurance. And then systematically move that limiting factor out of the way in order to rise up to a new personal record at your favorite marathon.